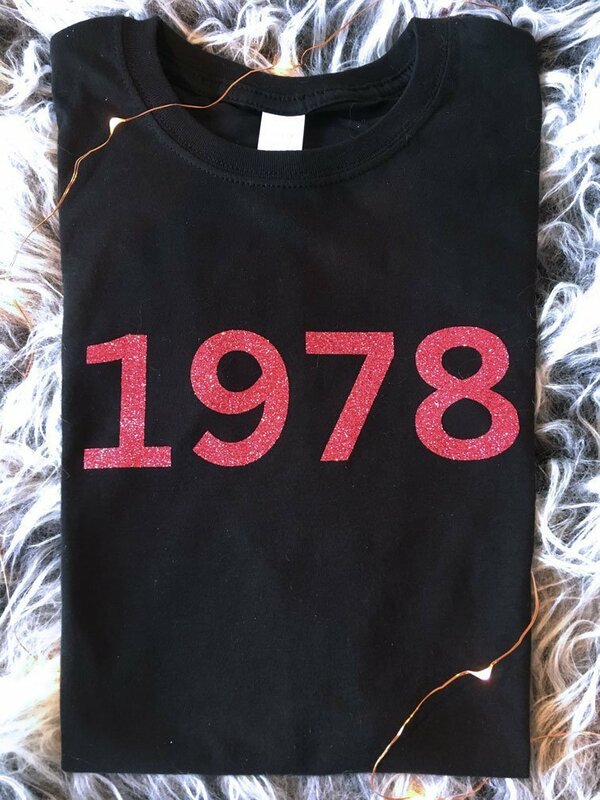 CELEBRATE a SPECIAL Birthday or Anniversary with a glitter/flock T-shirt with the year on it - 1948, 1958, 1968, 1978, 1988, 1997. Choose a t-shirt with your choice of YEAR emblazoned across it in glorious glitter or fabulous flock! Both are hard wearing vinyl, which is professionally heat pressed onto your tee. MAKE SURE TO SPECIFY YOUR CHOICE OF DESIGN OPTION IN NOTE TO SELLER WHEN ORDERING! Glitter: CHARCOAL (on red women's t-shirt in pic), PINK (on black women's T in pic), NAVY (on black Unisex T in pic), RED, GOLD, SILVER, HOT PINK, JADE, PURPLE, GREEN, LIGHT BLUE, MID BLUE, LAVENDER, NEON PINK, NEON YELLOW, NEON GREEN, NEON ORANGE. T-SHIRT COLOURS - Black, White, Red, Navy (other colours on request).